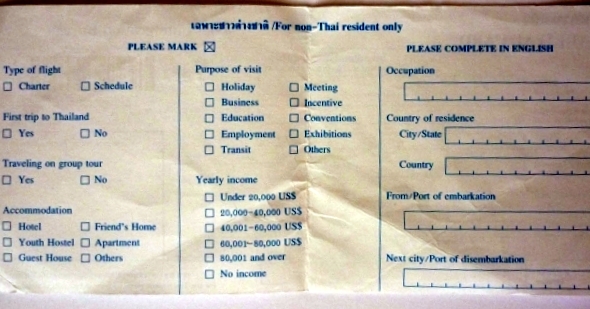 Foreign visitors arriving or departing Thailand are required to fill out an arrival/departure card. This is a two-part form that needs to be completed regardless of whether you are arriving/departing Thailand by air, boat or overland. This form should be filled out before you hand over your passport to a Thai immigration officer. Unfortunately, the failure of some visitors to do this is a contributing factor to the delays that sometimes occur during the immigration process, especially at Bangkok’s Suvarnabhumi airport. To help everybody out (immigration officers and the other people in the queue) please make sure the form is fully completed before you start to line up at the immigration desk. Where do I find these arrival/departure cards? If you are arriving in Thailand via an international flight it is usual practice for flight attendants to hand out the arrival/departure cards prior to landing. If for any reason you didn’t receive one of the forms (e.g you were asleep) just ask one of the flight attendants. If there are no forms available you will need to wait until you get to the immigration area at any of Thailand’s international airports where there are tables with a supply of the arrival cards. Similarly, if you are arriving in Thailand via a land or sea crossing there will be an area close to the Thai immigration counter where the forms are kept. Pens may be available, but don’t bank on it. You’ll help yourself (and the immigration officials) if you bring your own pen and make sure the form is correctly completed before you start to queue up. What information do I need to put on the arrival card? The information required for the arrival card is quite basic; name, passport number, nationality, date of birth etc. There will also be a space for you to put your address in Thailand. If you don’t yet have accommodation booked this should be the name of a likely hotel/guest house where you could be spending at least your first night in Thailand. If you do end up at another hotel instead of the one you wrote on the form, don’t worry. On most versions of the arrival card there is also a reverse side to be completed where you will be requested additional information including your occupation and income. Do I need to complete an arrival card if I have a tourist visa? Yes. If you are in possession of a Thai visa you should write the visa number in the space provided on the arrival card. What happens when I arrive at the immigration counter? Hand your passport and completed arrival card to the Thai immigration officer on duty. He will stamp and retain the arrival card and also place a stamp in your passport which tells you how long you have been given permission to stay. A date stamp will also be placed on the other part of the perforated form (the departure card) which will then be stapled to the inside of your passport before being handed back to you. What do I need to do with the departure card? The departure card needs to be kept with your passport for the duration of your stay in Thailand. When you depart Thailand you will be stamped out with an exit date in your passport and the departure card will be retained by Thai immigration. Always check you have been correctly stamped in and out of Thailand. If you are a first-time visitor to Thailand the process might seem a little confusing at first, but it’s actually straight-forward. Just remember to bring your own pen and take your time to fill out the form correctly before lining up at the immigration counter.